An integral part of healthful eating is making sure you always have the option to do so. And there is no easier way to set yourself up for success than to stock your refrigerator with nutritious foods. Storing healthy, readily available foods in your fridge keeps you on track, and rids you of any doubt or excuse to veer from your goal. Here are some of our go-to tips for stocking and organizing your fridge. The first step is to go through your pantry and refrigerator and toss anything that is expired. Next, sort through all of your packaged food, and check the ingredients. Anything that is loaded with sugar, refined flours, hydrogenated oils, or ingredients you do not recognize should be thrown away. If you need a little more guidance, check out the EWG’s Dirty Dozen Guide to Food Additives. Your next stop is the grocery store or local farmer’s market. When it comes to stocking your refrigerator, make sure to choose a variety of fresh fruits, vegetables, and lean protein. But since fresh produce has a shorter shelf life, make sure to buy things that you will consume within a week, or opt for frozen varieties. Your key for the dry food section is to look for packaged products with the fewest ingredients possible: oats, ground flaxseed meal, chia seeds, almond flour, nuts, BPA-free canned beans, and all-natural nut butters are a great place to start. One last but important note: never go to the grocery store hungry, and always bring a well-thought out grocery list. If you need a little help in this section, reach out to your LMN dietitian to receive your own personalized shopping guide. Research shows that a well-organized kitchen leads to healthier eating. Purchasing containers and pantry bins can help keep things in its proper place. When it comes to containers, look for ones made of glass, as plastic contains toxins that can act as an endocrine disruptor. Containers are great for prepped or prepared foods, and can help prevent food waste for when you have leftovers. Look for reusable produce bags to help keep your fruits and vegetables organized as well. Bins or canisters can also help keep spices, grains, and nuts in place, and adding a label to each one will encourage you and your family to continue putting things back where they belong. Organizing your kitchen is a crucial step in making healthful foods accessible. If you open your fridge to a rainbow of vegetables, you’ll go for a carrot and hummus snack, rather than the pudding that was once in its place. That means placing the foods that you want to be eating in the front of your refrigerator so it is the first thing that catches you eye. It is also just as important to know how to properly store your produce in order to ensure safe and healthy eating. If you’re still wondering about the best ways to store your food, make sure to check out our produce storage guide. Still having difficulty organizing your kitchen? 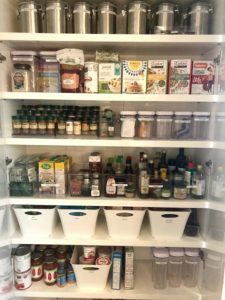 Lara Metz offers a kitchen-clean up, which includes a 30-minute Q&A session about your family’s food culture, and a 3-hour at home visit to sort, stock, and organize your kitchen. Contact your LMN dietitian for more details.